03/19/2019 - The Hershey Bears closed their 12-game season series against the Wilkes-Barre/Scranton Penguins with a dramatic, 1-0 overtime win on Tuesday night at Giant Center. Vitek Vanecek recorded his second shutout of the season, and ninth in his American Hockey League career, after stopping all 17 shots in net. The Bears conclude their season series against the Baby Pens with a 9-2-0-1 record. 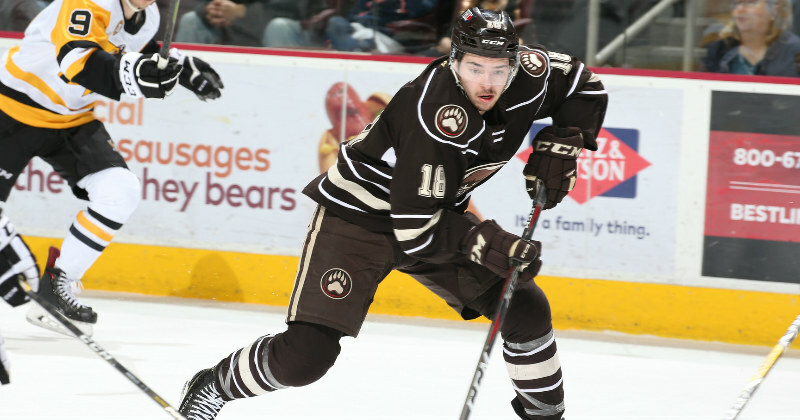 The victory tonight extends Hershey's current point streak to seven games. The Bears return to action on Saturday, Mar. 23 with the first of back-to-back games against the Cleveland Monsters. Puck drop from Quicken Loans Arena is scheduled for 7 p.m. Voice of the Bears Zack Fisch will have the call on the Bears Radio Network.